I rarely manage to make-up the “trendy” sewing pattern at its trendy time. While you all finished your Alder shirt dresses, I still sew Archers. In addition, when Alder first came out, I could not wait to make it up, but now I am having second thoughts. A-line may not be that flattering on me after all. Can you get more disappointing than this? This dress is in any big 4 catalogue, burda magazine and you can get a customized pattern by Lekala. What are you bringing to the cutting table? Apart from pulling at the bust. No, I’m not nice, I know. Hope for collaborative sewing exists. Lovely reader Miranda emailed me about this PR conversation that I had missed. Seeing how the community can engage in a project all together is heartwarming . I would not make that pattern because it’s not my style but it seems to appeal to many. My only regret is that the result of this awesome collaboration is yet another simple knit pattern for sale… BUT it should not detract from how great it is to witness all the contributions. Now back to the shirt! Pictures are still from my Iphone, but for once the location is NOT my garden, YAY! My dog is therefore NOT in the background, (NAY?). I spent a week by Lake Atitlán in Guatemala (highly recommended) in August and I packed some garments to photograph on the beautiful terrace of the house we rented. Please note that this is not the pattern straight out of the printer. 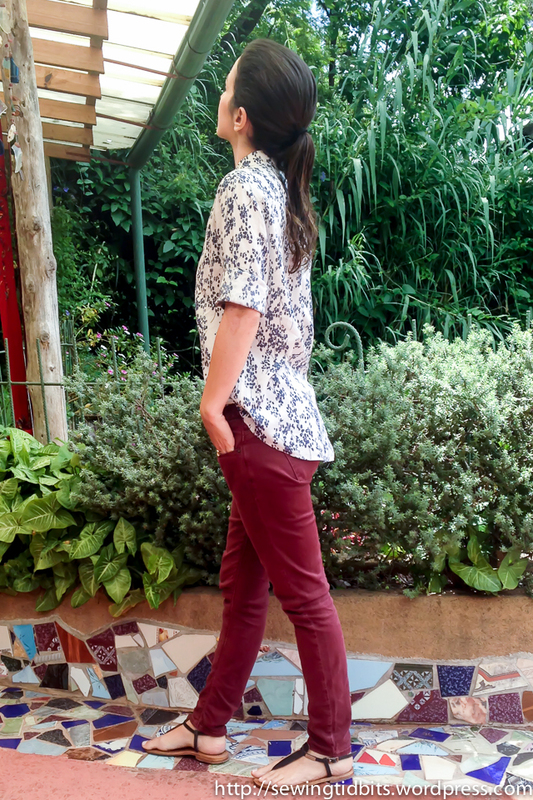 I was happy with my first version of the shirt (see my shirtdress version) but I want to create a TNT pattern for boyfriend shirts and I am glad to report that it is almost a success. To guide my fit alterations, I used a Banana Republic shirt I love. 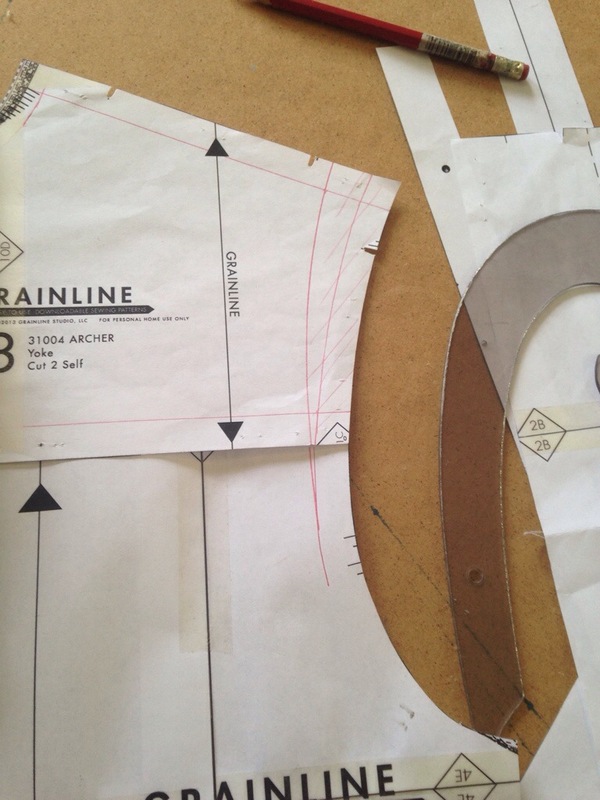 I measured elements like shoulder length, waist shaping, pocket placement, final length, etc. Beth’s post on Craftsy is timely as it is exactly what I did! adding 3″ of overall length, and note that I am only 5’3″. But I like my shirts tucked in and I want to raise my arms without exposing skin. I also tried to use more advanced sewing techniques, and I will do a detailed post. Some worked (tower placket, button placket, cuff construction) and some did not work at all (ouch, collar+stand). Sometimes, a “if it’s not broken, don’t fix it” approach is best. I never had a problem with stand collar construction before so why did I try to find a better way to do it? Don’t know… Some of my techniques required pattern alteration or drafting of extra pieces. Look out for the post next week soon! I almost forgot to tell you that the fabric is one of the pieces I brought back from Paris last June. I found it at the cotton stand of Marché St Pierre. However, looking at the drape I guess some rayon is thrown in. While I prepare my post on shirt construction, I would love to hear from you your favorite shirt making tutorials. I am familiar with the Archer Sew-along, Fashion-Incubator, Off the Cuff, Male Pattern Boldness and Sewing Square Walls but I may be missing on important ones! Please, fill me in! 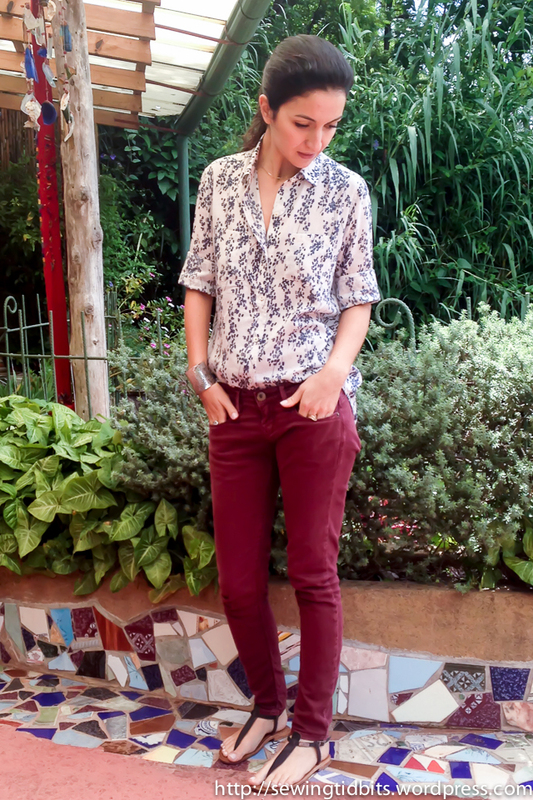 Slouchy white linen pants and thoughts on the online sewing world. I really like this shirt. Your version is very chic and I think the pattern itself is something wearable, challenging enough and flattering. I’ve been wanting to tackle the Archer for a while now, maybe, as we’re late to the Archer party, we can consider ourselves part of an Archer renaissance? Also, disappointing is right. I pretty much like most of their designs, not my style but this is a bit underwhelming. Maybe it’s the wrong time of year? Maybe it’s the fabric I’m responding too? I loved your last post and your blog is one of my absolute favourite reads. Honest and thoughtful with independent opinion. I love the Archer Renaissance, I will totally use it in the future!! Gorgeous shirt! It’s really worth it to put a lot of effort into fitting a pattern that you know you will be using again and again. I’ve been wondering if the Archer shirt would work for me, so I thought I’d ask you: are the sleeve caps symmetrical? I find shoulders so fiddly to fit, I’d rather start with a pattern that has some nice shaping in the shoulder. It looks lovely on you. 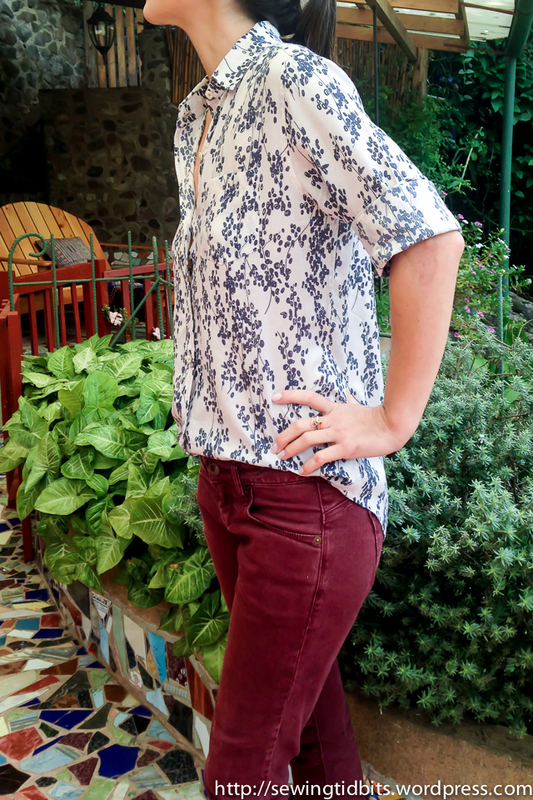 Right now Sew Maris is running another shirt sewalong and she’s a guru when it comes to shirt making – highly recommend you check her out. And yes that pattern is terribly beige. What I’ve found to be most disappointing on burdastyle is they’ve gone right away from the sewist members and are just focussing on seminar after seminar – I used to love the top makes of each month, and now it’s just about selling. Disappointing. Thanks Sarah!! I had no idea about the Sew Maris sew along and it looks great! I agree with you about Burdastyle, everyday I am tempted to take it out of my reader because I cannot take one more webinar advertisement!! It is so far from where they started… Very very disappointing! Fab shirt! The fabric looks really lovely and the fit is great! Thanks Jana! I love Andrea’s blog, it is one of my favorite! Your shirt is beautiful. I love how it drapes. I have to confess, the Archer shirt is not one that attracts my attention, but your shirt has changed my mind! Thank you Sylvie! I believe that it is all about the drape of the fabric, maybe some rayon will do you better than stiff cotton! 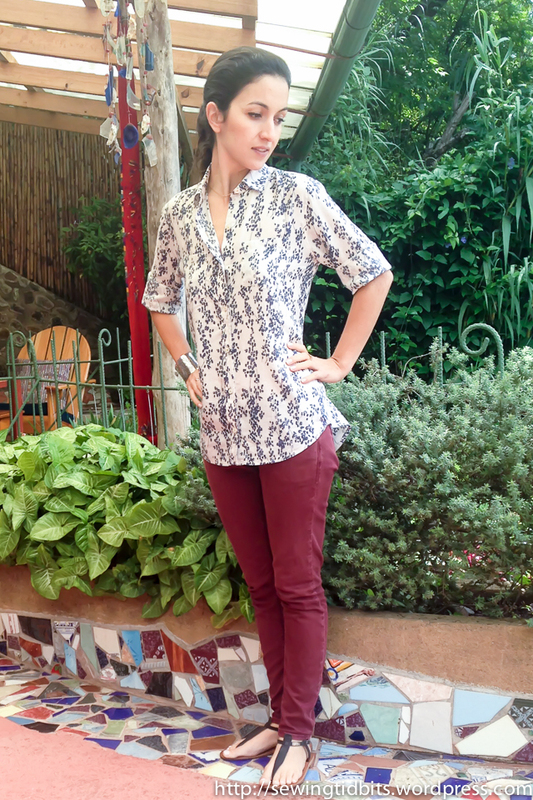 Your shirt looks fabulous – I have been tempted lately to purchase the Archer as so many makes have turned out well. I haven’t made a shirt in years and the memory of them has been putting me off!! I have often considered this pattern…but thought maybe the should aren’t roomy enough for my build and dd bust. I may give it a try.